As the picture above shows, 30 years on and Los Angeles is still the grimy, dark and hostile environment that we were introduced to in 1982's Blade Runner. 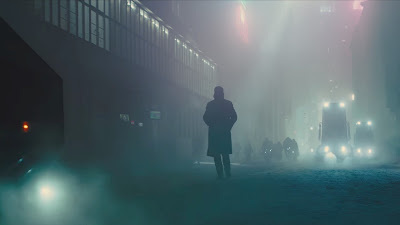 In this film, Ridley Scott's original feel and look of the Blade Runner world are faithfully reproduced and developed under the guidance of Denis Villeneuve. The soundtrack is even Vangelis like in character. This film is not only faithful to the visual and aural components of the original, but the story continues to ask the same question - 'what is life'? Officer K/Joe is a role Ryan Gosling was born to play. As technological advances mean that there is even greater integration between humans and androids to produce 'replicants', K works as a Blade Runner for LAPD - he is himself the latest version of replicant, the Nexus 9. Nexus of course means meeting point and embodied within the Nexus 9 is the meeting of human and machine - but is he simply a machine or is he alive? What is life? This is a big question and Blade Runner 2049 is a big film. The focal point is so often located in a much wider view (as above) whether that be the urban sprawl of LA or the desert or a disused machine hall or mound of rubbish. At nearly 3 hours long I found myself questioning whether it moved too slowly, but I kept coming back to the idea that in trying to answer such a big question, a big canvas was appropriate and with that a long time-scale to explore the story. No, I don't think it is over long. This is a film filled with the best and the worst of human emotions. Love, hope, happiness, sacrifice, duty, regret, fear and avarice all play out in a violent world redeemed by pockets of intimacy where notions of love and hope are kept alive. There is talk of miracles and discussion of what it means to have a soul and how that then links to whether or not that constitutes life. This film is more open in dealing with metaphysical questions but leaves the viewer to construct an answer. Human development is inexorably heading towards a point where Artificial Intelligence (AI) will have the capacity to mimic humanity. The intention of such development in the world of Blade Runner is that replicants are 'slaves' who perform the tasks humans don't want to, or which are unsafe for humans to engage in. The whole point of AI is its capacity to learn and evolve. What happens if and when human and AI evolution intersect and hybrids develop? How human will they have to be, to be deemed as being alive rather than simply existing as machines? History shows us that slavery never has a neat or equitable outcome - it is still a problem we are dealing with today. Simply making slaves that are 'less than human' doesn't really change the argument - does it? From a Christian perspective, how will all of this impact on notions of what it means to be made in the image of God? The film contains many strong acting performances in a world where gender inequality appears to be a thing of the past - although sexual holograms and prostitutes are all female, so perhaps it is only the appearance of equality the film gives? Robin Wright as Lieutenant Joshi and Ana de Armas as Joi both give compelling performances. It was good to see Harrison Ford reprise his role as Deckard (or if I was unkind Harrison Ford!) but for me the stand out performance was from Sylvia Hoeks playing 'the best of Angels' Luv. Ridley Scott's DNA runs throughout this film as he oversaw production, but it is probably the original Blade Runner's writer, Hampton Fancher's screenplay that gives greatest continuity with the 1982 offering. I hope they all stick around as this story has plenty of scope for further developments and more films in the Blade Runner franchise. As you may have gathered, I liked it - a lot. It's not often a sequel matches the original but for me in this case it does, so I will award it 9/10!